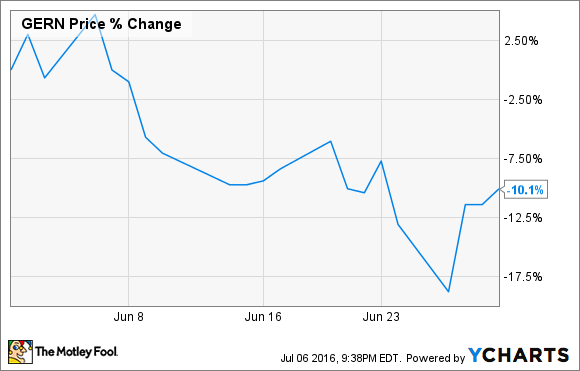 Is Geron Corporation's Stock a Good Bargain After Falling 10% in June? Geron takes another leg down. What: Shares of clinical-stage oncology company Geron Corporation (NASDAQ:GERN) fell by over 10% last month, according to data from S&P Global Market Intelligence. The biotech's stock price took a hit as a result of the market-wide pullback stemming from Britain's decision to leave the European Union. So what: Geron has struggled this year, as the U.S. presidential election has put drug pricing in the spotlight. In short, the market is apparently concerned that novel drugs, such as Geron's blood-cancer product candidate, imetelstat, that it's co-developing with Johnson & Johnson (NYSE:JNJ), won't command premium pricing points upon entering the market -- perhaps making the risk of waiting out the lengthy and highly uncertain clinical trial process unpalatable for all but the bravest of investors. Despite Geron's rough year already, though, Brexit sparked yet another dramatic sell-off in this beaten-down biotech stock. Now what: Johnson & Johnson's biotech subsidiary Janssen is scheduled to perform an internal review of imetelstat's ongoing trials for myelofibrosis and myelodysplastic syndromes in the second half of this year. As Geron's cupboard is essentially bare apart from imetelstat, these forthcoming internal reviews could prove pivotal in terms of the biotech's future. The long and short of it is that Geron hopes that imetelstat turns out to be a disease-modifying treatment for various forms of blood cancer, giving it the edge against the current slate of treatments. If not, this tiny biotech may end up having a hard time keeping the lights on. As clinical trials are notoriously difficult to handicap and more often than not produce negative results, my take is that investors are probably best served by steering clear of this high-risk developmental biotech right now.